As part of Painting the Divine: Images of Mary in the New World, the History Museum will host a free two-day symposium, Sept. 27-28, with talks by scholars, music, a wine reception, book signing, and a peek inside of La Conquistadora’s closet at the Cathedral Basilica in Santa Fe. For details on the event, click here. A 1960s’ ecclesiastical wave of urban renewal inspired mission churches throughout the Americas to undergo renovations and, all too often, cast off centuries-old artwork. Charles W. Collier, a cultural attaché to Bolivia, and his wife, Nina Perera Collier, began purchasing and obtaining pieces that eventually formed the backbone of the International Institute of Iberian Colonial Art, once based at their Los Luceros estate in northern New Mexico. In 2005, with the promised construction of spacious galleries and a state-of-the-art collections vault at the New Mexico History Museum, the Institute donated 70 paintings and three sculptures. When Painting the Divine: Images of Mary in the New World opens on June 29, 35 of these 17th- and 18th-century masterpieces will share one exhibition space for the first time ever (through March 13, 2016). Painting the Divine includes works from Spain’s three colonial capitals: Peru, Mexico and New Mexico. Together, they reveal how faith sustained Spanish colonists in harsh and remote frontiers and how their religious art evolved in those places. European paintings traveled to Mexico City, where local artists recreated them. Those works traveled to Peru, where another school of religious art developed. Paintings journeyed up El Camino Real to adorn New Mexico mission churches and private homes. Once here, they inspired local artists who lacked canvas and oil paint and so used the materials available to them to create art—thereby developing into wholly new artists: the santeros, whose work thrives throughout the Southwest today. Josef Díaz, the museum’s curator of Southwest and Mexican colonial art and history collections, chose iconic pieces from the Collier Collection and paired them with modern interpretations by artists such as Ray Martín Abeyta, Arthur López, Charlie Carrillo, Ramón José López, Alfredo Arreguín, and Marion Martínez. The museum conserved 12 of the paintings. The cleaning, repairing and stabilizing accomplished by Denver-based art conservator Cynthia Lawrence is detailed in the exhibit through a video created by New Mexico Highlands University media arts students. Rounding out the exhibit are loans of colonial paintings from other owners, including St. Anthony’s Catholic Church in Pecos and Our Lady of Belen Catholic Church, south of Albuquerque. Painting the Divine dovetails with the Palace of the Governors’ long-term exhibition, Treasures of Devotion/Tesoros de Devoción, which celebrates the bultos, retablos, and crucifijos created by santeros from the late 1700s to 1900. By choosing paintings that depict Mary, Díaz creates a focal point for the galvanizing role that religion played in colonists’ lives. 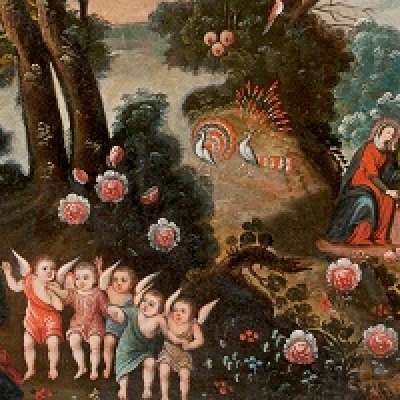 The exhibit explores and defines her various images—from Our Lady of the Lote Tree (Melchor Pérez Holguín, 1716, Bolivia) to The Visitation (unknown artist, ca. 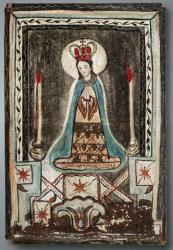 1750, Mexico) to the only known canvas painting by a New Mexican santero, Our Lady of the Lakes (José Aragón, ca. 1800). Of note to Díaz is how the paintings illustrate the trade in fabrics throughout the Americas. “The textiles include lace from Flanders, brocade from Europe, fine silks from the Philippines.” Even today, devotees of La Conquistadora at St. Francis Basilica in Santa Fe bedeck her in fine fabrics. The exhibit includes one of her outfits made from 18th-century silk from China—itself an emblem of Mary’s appearance in worlds far from the studios of European masters. Fresco Publishing is releasing a companion catalog to the exhibit authored by Díaz and Suzanne Stratton-Pruitt, a leading art historian specializing in arts of South America. The book includes 34 images from the Collier Collection, along with the story of the Colliers, a renaissance couple whose keen eye saved these artworks for generations to come. Essayists in the book are Díaz, Stratton-Pruitt, Kelly Donahue-Wallace and Tey Marianna Nunn. Painting the Divine is supported by the Consulate of Mexico in Albuquerque, the New Mexico Humanities Council, and many other generous donors. Sunday, June 29, 1–4 pm, Exhibition opening. Free with admission. Children 16 and under free daily. Enjoy classical guitar by AnnaMaria Cardinalli. See art conservator Cynthia Lawrence demonstrate some of her technique. Make a take-home ramillete (paper flower). Refreshments courtesy of the Women’s Board of the Museum of New Mexico Foundation. Saturday, July 19, 1–3 pm, Printing Our Lady, Gathering Space. Free with admission. Children 16 and under free daily. Bring the family and print a historic image of Our Lady on a replica medieval press. Using a Bobcat Press built in the 1970s by Cedar Crest’s Richard Hicks, visitors will get a feel for how colonial artists found images to paint. Palace printers Tom Leech and James Bourland have selected an image of the Virgin investing St. Alphonso with a chasuble. In 1544, it was the first full-page woodcut printed in a book in the Americas by the first printer in Mexico, Juan Pablos. The book was Juan Gerson’s Tripartito del Christianissimo, and the original block was probably carved in Iberia. It was reproduced in a reduced size in Printing in Spanish Colonial America, by Hensley Woodbridge and Lawrence Thomson, 1976. (Palace Press collection). Sunday, August 3, 2–4 pm, Schola Cantorum, museum lobby. Free with admission. Sundays free to NM residents; children 16 and under free daily. Back by popular demand, Santa Fe’s Schola Cantorum performs “Echoes of Mary,” seldom-heard sacred music dedicated to Mary from the cathedrals of Mexico City and Cuba to the capillas of northern New Mexico. Schola was founded in 1990 by Dr. Billy Turney during his 25-year tenure as music director of the Cathedral Basilica of St. Francis. In 2013, Schola performed in St. Peter’s Basilica in Rome, as well as basilicas in Venice and Florence. Next year, Schola plans a concert tour of Ireland. Saturday–Sunday, September 27–28, 9:30–3 pm, Painting the Divine Symposium: Mary in the New World, museum auditorium. Free. Learn more about the venerations of Mary in the Americas from scholars and art historians, including Maya Stanfield-Mazzi, Clara Bargellini, James Cordova, Jeanette Favrot Peterson, Tey Marianna Nunn, Kelly Donahue-Wallace, and Suzanne Stratton-Pruitt. Topics include the function and reception of Marian images in the Americas; monjas (nuns) and their use of Marian imagery in colonial Mexico; and dressed statue paintings in the Americas. For more details, click here. Sunday, October 5, 2–4 pm, Albuquerque Baroque Players, museum auditorium. Free with admission. Sundays free to NM residents; children 16 and under free daily. A performance of 17th- and 18th-century chamber music from Italy, Germany and France by MaryAnn Shore (oboe and recorder), Mary Bruesch (viola da gamba) and Susan Patrick (harpsichord). The Aluquerque Baroque Players formed in 1997 and have since performed at the Fellowship Christian Reformed Church, the Historic Old San Ysidro Church in Corrales, the Cathedral Church of St. John, First United Methodist Church, the Albuquerque Museum, and the Albuquerque Public Library. Sunday, November 2, 2–4 pm, Tattoo Nation, museum auditorium. Free with admission. Sundays free to NM residents; children 16 and under free daily. See the 2013 documentary and hear from Director Eric Schwartz. Tattoo images of saints and specifically images of the Virgin Mary are popular in Latino and contemporary culture, among men and women. Many early tattoo designs were copies of icons and paintings widely found in churches. Today, Virgin Mary tattoos come in a wide array of styles and designs, all of which are notable for their beautiful color composition, artistic quality, and dramatic effect. This documentary explores how sacred images have permeated the world of tattoos and what they mean and symbolize to the people who bare them. For more on the film, log onto http://www.tattoonation.com/. Sunday, March 15, 2015, 2–4 pm, 18th-Century Harpsichord Music, museum auditorium. Free with admission. Sundays free to NM residents; children 16 and under free daily. Susan Patrick performs and discusses 17th- and 18th-century chamber music from Italy, Germany and France. Patrick is an associate professor emerita in the Music Department at the University of New Mexico, where she taught classes in music history for 30 years. She has played with the New Mexico Symphony Orchestra, the Chamber Orchestra of Albuquerque, the Desert Chorale, Santa Fe Pro Musica, the Santa Fe Symphony, the Orchestra of the Duke, and other ensembles and is a founding member of the Albuquerque Baroque Players. Need photos? Download high-resolution images from the exhibit by clicking here (or log onto http://media.newmexicoculture.org/mediabank.php?mode=events&action=files&instID=19&eventID=1945).